Online Resources: Updated ENERGY STAR Sell Sheets Look for the Next Summer CFS Newsletter! Do you receive requests for ENERGY STAR CFS equipment and not know where to begin? Do you struggle knowing where to find ENERGY STAR rebates, information on products, or upcoming regulations? Do you wish you had more information on ENERGY STAR CFS equipment specific to your selling needs? EPA is developing a Dealer & Distributor Toolkit to provide customized, market-based strategies for selling and promoting ENERGY STAR CFS equipment. In February, EPA met with dealers and distributors in the D.C. area to identify opportunities for cross-collaboration and ways that ENERGY STAR can support their efforts to sell ENERGY STAR equipment. Each stakeholder provided valuable feedback that we will incorporate into the new Toolkit in development. We are always looking for more dealers and distributors to work with – the more feedback the better! The only way we can make an effective Toolkit is by working with YOU. Please send an email to CommercialFoodService@energystar.gov if you would like to contribute to this innovative effort! EPA is preparing to revise the current ENERGY STAR Commercial Dishwasher Version 2.0 Specification. In anticipation of this revision and in support of EPA’s data assembly effort, EPA encourages manufacturers to apply the ASTM F1696-15 and ASTM F1920-15 test methods to eligible products. The amended test methods capture wash cycle energy, which provides a more robust total energy profile of the washers. Data submission and other inquiries are welcome and can be submitted via e-mail to CommercialDishwashers@energystar.gov. In response to the U.S. Department of Energy’s (DOE) final rule scheduled to take effect on January 28, 2018, EPA will begin a data assembly effort and specification review. Pending the information gathered during the review, EPA may revise the current ENERGY STAR specification. EPA released the Draft 1 Version 4.0 Commercial Refrigerators and Freezers Specification on March 24, 2016. The specification is being revised in response to the DOE’s amended final rule scheduled to take effect on March 27, 2017. EPA will be hosting a webinar on the Draft 1 proposal on April 21, 2016, at 1:00pm EST. You may register here. The draft proposal and other corresponding documents are available on the ENERGY STAR Commercial Refrigerators and Freezers product development webpage. Did you know that EPA recently updated all eight CFS product sell sheets? These resources offer key selling points that dealers, designers, consultants and manufacturers can use to educate potential customers about projected lifetime savings, available rebates, design approaches that reduce energy consumption, and so much more. Let’s all help get the word out! 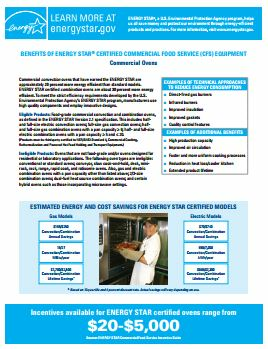 ENERGY STAR encourages manufacturers to include these as point of sale promotional materials so that manufacturers, dealers, consultants, and designers alike can utilize them to educate end-users on the cost and energy savings of ENERGY STAR equipment. For those interested in co-branding the eight product-specific Sell Sheets, please contact CommercialFoodService@energystar.gov. ENERGY STAR team members will be attending the 2016 Foodservice Consultants Society International (FCSI) Nashville Conference from April 14 - April 16, 2016. The team is looking forward to this event, and identifying new opportunities to support our partners and stakeholders. Please feel free to reach out to Carly.Burke@icfi.com if you'd like to schedule a meeting! Kirsten Hesla, EPA, and additional ENERGY STAR team members will be attending the National Restaurant Association (NRA) Show 2016 from May 20-24, 2016 in Chicago, IL. The ENERGY STAR team will visit partners on the show floor to discuss newly certified product offerings and ENERGY STAR collaboration opportunities. Let's Meet! EPA invites partners and stakeholders to schedule individual meetings with the ENERGY STAR team. Please email CommercialFoodService@energystar.gov to schedule a meeting. EPA is also happy to review marketing materials prior to the Show, upon partner request. Each year, EPA honors organizations that have made outstanding contributions to protecting the environment through energy efficiency. Whether a first time Partner of the Year winner or a Sustained Excellence winner, these organizations from across the country are leading the energy efficiency movement. Congratulations to the 2015 ENERGY STAR Award winners! Details on this year’s ceremony and award winners will be featured in the next edition of the CFS Newsletter. The goal of the ENERGY STAR Emerging Technology Award (ETA) is to celebrate new technologies that have the potential to significantly reduce energy use and greenhouse gas emissions without sacrificing top-of-the-line features and functionality. As a reminder, EPA has chosen Innovative Refrigerant Systems as the 2016 ENERGY STAR Emerging Technology Award category and has extended the Demand Control Kitchen Ventilation Award category into 2016. EPA has added Innovative Refrigerant Systems as a 2016 ENERGY STAR Emerging Technology Award category. The Award recognizes efforts by manufacturers to incorporate low global warming potential refrigerant systems into product designs. EPA is accepting manufacturer submittals for technologies that meet the Award requirements and will announce winners on a rolling basis. Product submittals can be sent to EmergingTech@energystar.gov. Additional information can be found at www.energystar.gov/emergingtech. Systems offered by Streivor Air Systems, Inc. received the ENERGY STAR 2016 Emerging Technology Award for DCKV. Streivor’s DemandAire™ system receives continuous data from the temperature monitors located in the exhaust hood and/or duct. Utilizing the temperature data, the Motor Control System will automatically turn the exhaust and make up air fans on when the temperature exceeds the low temperature set point. The full list of recognized DCKV systems can be found at www.energystar.gov/emergingtech. Look for the Summer Commercial Food Service Newsletter! For more information, visit: www.energystar.gov/cfs or email us!